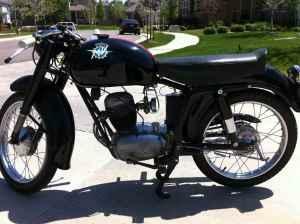 Selling my 1954 MV Agusta 125 TR. I bought this bike from a well known collector 3 years ago and ahve done a partial restoration. New paint, new hardware, went through entire bike. Motor runs STRONG and bike rides like a dream. All parts are NOS from the UK MV Agusta spares club. I put on clubman bars and new shocks but have the originals. I love this bike but I need something I can ride daily. Clear Colorado title in my name. These bikes were never imported so a title is a rarity. I must admit that I know very little about these wonderful two strokes. This bike was purchased from Harper-Smith a few years ago , and comes to us from the owner who pinged us through RSBFS. The bike looks very good indeed, and I couldn’t imagine owning a classic MV Agusta for so little cash. Sure, it is a bit of a tiddler and won’t be freeway legal in most states, but for an awesome looking around town bike this would be hard to beat. Click here to view the Craigslist advertisement. Good luck to the seller!